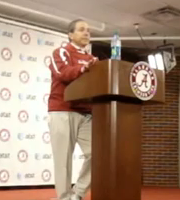 Coach Saban got the spotlight earlier this week for letting some colorful language (the "s---" curse word) come out after being asked some pretty lame questions by the media. Now he is drawing the line in the sand for the media to follow so that they know the rules. Not exactly a Spurrier rant (thankfully) but he does make himself clear. He pretty much indicates that he wants to avoid negative national publicity and his focus is on the game this week.